July is STEAMy at Stratford School, Pleasanton campus. In addition to two special events on July 15th and 16th, you can still enroll your children in fun, enriching, experiential learning programs where they’ll make new friends while staying sharp and ready to start the school year with confidence. STEAMy Summertime where learning brings a whole new meaning to Fun at Stratford School — including coding for girls! Summer is STEAMy at Stratford School, Pleasanton campus. There’s still time to turn up the heat and enroll children in fun, enriching, experiential learning programs where they’ll make new friends while staying sharp and ready to start the school year with confidence. STEAM-based (science, technology, engineering, art, math) activities happening at Stratford’s Pleasanton location offer a flexible and fun way to spend the summer. Children are welcome to sign up regardless of enrollment at Stratford. Summer@Stratford offers two options for summer enrichment: Camp Socrates and STEAM camp; an innovative a la carte opportunity to learn and grow based on a child’s specific interests and curiosities. Stratford’s original, enriched Camp Socrates summer day camps (four and seven week programs) offers campers in preschool through fifth grade the opportunity to learn, explore and engage in camp-style activities and enriched academics throughout the summer. The day begins with team building through collaborative camp play. Morning sessions engage the mind with creative and interactive reading, math, and writing activities that promote critical thinking and strengthen fundamental computational skills, followed by invigorating afternoon STEAM sessions and outdoor adventures. 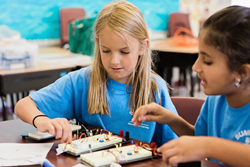 Stratford’s innovative STEAM program at the Pleasanton campus gives 1st through 5th grade campers an opportunity to explore, as they discover new areas of interest and develop lifelong skills. This program offers flexible enrollment without having to commit to a full summer course. Campers will enjoy a wide-variety of STEAM and enrichment activities tailored for their summer adventure. One week a student could be designing and building a roller coaster. The next week they could be commanding a space ship, writing code, or perfecting their programming skills. Parents are invited to discover an adventure in learning at: http://www.stratfordschools.com/summer-camp. Songs and Story Time with a twist! Help Goldilocks find her way out of the woods with our friends Dash and Dot during this creative story time adventure filled with songs and engaging activities by Ms. Amina. Children in grades 4 through 5 who are eager to learn computer science, are invited to collaborate, innovate and bring their ideas to life. The Hackathon is structured to teach students to become builders and creators, and not just consumers of technology.